Quince - Champion 2 year old £17.50 - Pears and Quince Apple Trees and Fruit Trees For Sale. Buy at competitive prices with wholesale discounts. 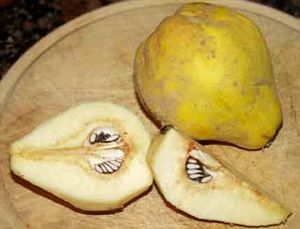 Champion is one of the most reliable and disease-free Quinces, giving regular crops of large rounded fruits. The fruits are greenish yellow turning golden when ripe and flesh is tender and mild in flavour. Champion is notable for its tolerance to damper soils than some other Quince varieties, though it will not thrive in very wet soils.